How do I undo a page import? Use the "Revert Import" option to restore the original version of any page you've imported into Shogun. 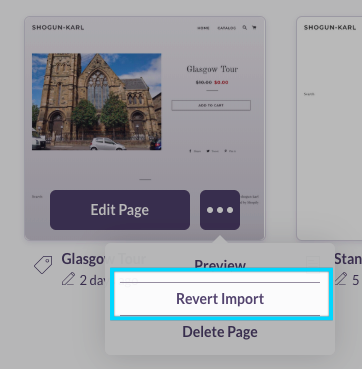 If you need to un-import a page for any reason, you can easily do so by using the "Revert Import" option in Shogun. To reverse a page that has been imported into Shogun, first you can locate page in your Shogun dashboard. Click the three-dot Settings button, and select the "Revert Import" option. Note: This process will not delete the page from your store. After the import has been undone, the page will still exist in your store's dashboard.